Club reporter reveals one thing Jonjo Shelvey has done to “frustrate” Rafa Benitez – NUFC blog – Newcastle United blog – NUFC Fixtures, News and Forum. 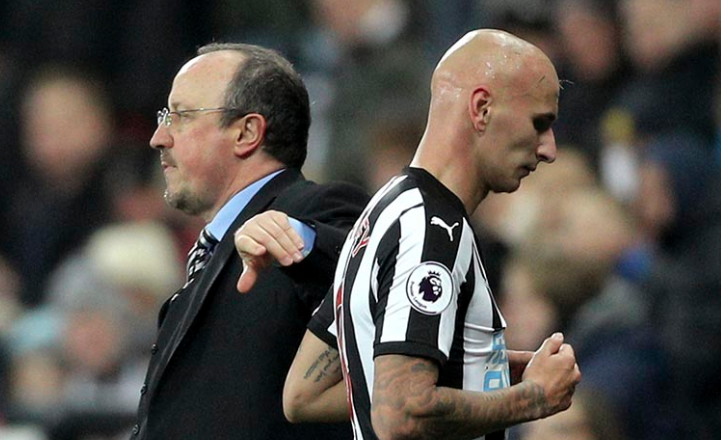 According to the Chronicle’s Chris Waugh, Jonjo Shelvey’s ‘repeated attempts’ to rush himself back from injury have ‘frustrated’ Rafa Benitez – feeling he’s been sidelined for longer periods as a result. “There have been whispers behind the scenes for months that Shelvey’s repeated attempts to rush himself back from injury – which in the process led him to be sidelined for a longer period than was necessary, including during the hectic and brutal festive period – frustrated Benitez. “Trying to get yourself back fit early once is understandable; but to breakdown on multiple occasions is not something Benitez will countenance. “What’s more, there has always been a suspicion that Shelvey is not really a ‘Benitez player’. Had Newcastle received a substantial cash offer for the midfielder in recent windows, and had Benitez been confident he could have reinvested the money in a replacement, then Shelvey may well have been sold. Not coming on during the defeat against the Gunners, especially when we needed a creative spark in the middle of the field, has to put the long term future of Shelvey in doubt. He has bounced back from similar disappointments under Rafa, I remember when he initially wasn’t even first choice during the start of our season in the Championship, but some fine displays when given a chance meant he came back into the starting XI – and stayed there. The writing could be on the wall this time though, with a move to West Ham mooted in the summer. Shelvey has talent, that is clear, but poor discipline and fitness issues, combined with not enough consistency means Newcastle are likely to look elsewhere; especially if Rafa stays. This is a typical Chris Waugh article. There have been whispers ….there has always been a suspicion …. not really …..Had (something happened) ……..and had ……. could have ….then …..may well have……. could be ……there have been rumblings ………. if ………could expect …….even given …..